The Tang Wai Min, Sam Leong Tak Sum and Sam Lee Chan Sam produced, Leong Tak Sum directed, Japanese actors Natsuna and Hiroshi Shinagawa and Hong Kong representatives Lee Chan Sam and Candy Lo (Law Lam) starred LOVE REVOLUTION (OI GAP MING) was selected for the 9th Okinawa International Film Festival. Earlier director Leong Tak Sum led Natsuna and Hiroshi Shinagawa to attend the opening ceremony and the advanced screening. The audience responded enthusiastically to the film and Leong Tak Sum said that he was very happy to be able to bring the film to Okinawa for the Japanese audience to enjoy. Law Lam arrived at Okinawa that day and attended the red carpet ceremony to promote the film. 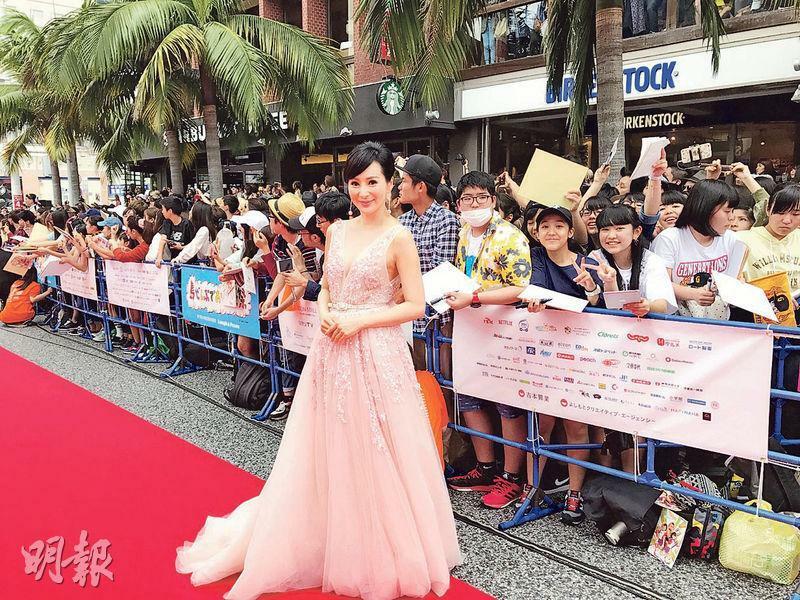 This was Law Lam's first international film festival and was honored to walk the red carpet. She admitted that she dressed up for the occasion. "Recently 'fairy presence' has been all the rage, I finally chose a dress with 'fairy presence'." Law Lam said that when she received the film festival invitation she felt very happy and very honored. She was also happy for Leong Tak Sum. "This time at the film festival I saw the director, Natsuna, Hiroshi Shinagawa and others again, I was reminded of how happy the production was. Playing a female assassin in the film was a new attempt, I was able to achieve the expected result." Currently working on a series, Law Lam admitted that she almost was unable to make the trip. Unfortunately producer Mui Siu Ching and the team gave her a few days off.